The Newton Motion running shoe has been a favorite of mine since its inception. I was a little skeptical of the Newton shoe and idea of adding lugs to the sole of a shoe to promote natural running movement. I really thought this was an idea that would come and go like the Vibram running shoes. Fast forward 5 years and I’m still a believer in this brand and the Motion shoe. Not only is this shoe comfortable, lightweight, and stylish, but it helps promote a natural running form. I really like mixing these shoes in with the other shoes I train so that I can work on my form and mix up my footwear. These shoes are similar to my previous post of the Newton All Weather Motion Shoe, except this is the newer model that has 5 lugs instead of 4. The Newton Motion running shoe is a shoe that I will always keep in my running shoe inventory. As I mentioned above, these shoes look great, feel great (thanks to the dual density midsole), and really do promote a natural running form. These shoes always help me improve my form and allow me to be more efficient as a runner. Something that I think we all should strive for. This model has a reduced heel-to-drop, which makes this feel a little flatter than previous models. So far, the reduced drop feels great. This high mileage trainer is a shoe that will allow you to enjoy your daily runs. I highly recommend picking up a pair of these. The efficiency gained from improved form will pay dividends regardless of any other shoes you run in. Having worn the initial Newton Motions, I had a feeling I would like the revamped Newton Motion III. The additionl of the 5th lug and reduced dropped had me excited to give these shoes a try. I have had 4 pairs of the Newton Motions before and was excited to see how different these shoes really were. I have seen plenty of people at local races wearing the newer model, but never tried on myself. The blue, green, and red colors really caught my eye and was yet another reason to pick these up and give them a try. 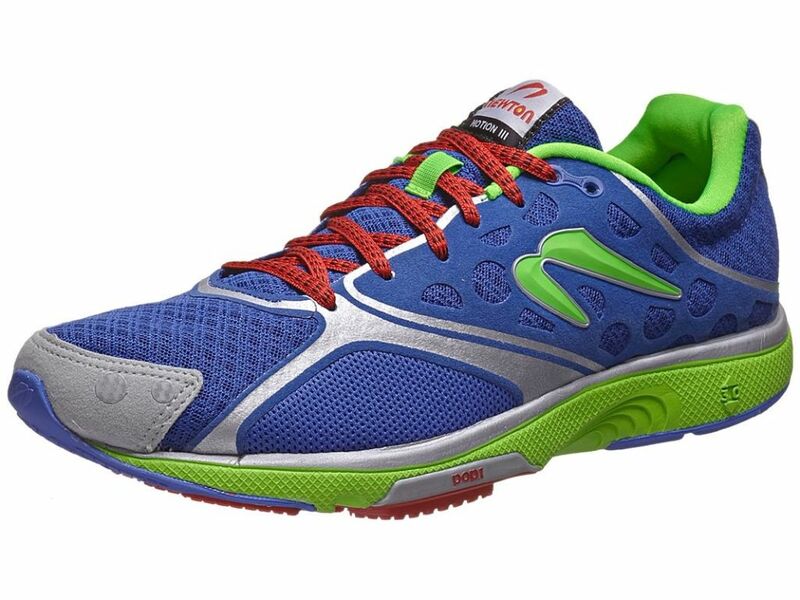 The Newton Motion III Shoe is another one of the many great shoes that Newton sells. If you look up this shoe on the web, you will see over and over about people talking about how this is a high mileage trainer that can be used for daily training, tempo runs, and even racing. The flexibility that this shoe provides is one of the many things that make it unique in my opinion. The great thing about this model and the Newton Motion models going forward is that you no longer need to order a 1/2 size up. The original Newton Motions were sized a little different and required you to order up. Thanks to Newton for finally fixing this sizing issue. The Newton Motion III sole was updated with this model. As you can see in the pictures above, this shoe now has 5 lugs instead of the 4 on the original Newton Motion models. The midsole and outersole contain action/reaction technology which allows the shoe to better absorb the pounding that your body takes while running. It also improves the lift or energy used when pushing off. Similar to previous models, the shoe contains a high-rebound sole that is durable and responsive. Something you will notice immediately when running. The rubber compound used on the sole is made up of a high density and high-abrasion compound that helps improve the durability of this great shoe. The Newton Motion III shoe upper is different than the original Newton Motion and Newton All Weather shoe that I previously reviewed. The mesh upper keeps the shoe light and allows the foot to breath and remain dry. The updated lacing structure improves the fit and secures the foot with improved comfort. The liner inside the heel is composed of anti-bacterial material that is extremely comfortable. You will notice this immediately when putting the shoe on. The overall upper is beautiful. The color scheme and materials really make this shoe look great. The Newton Motion III running shoe is a reminder of why I keep this model in my running rotation. This shoe continues to be a great daily trainer that helps me maintain and improve my running form. The updated model is lighter, faster, and even more comfortable. The great color scheme makes this eye catching, something your running friends will notice. Without a doubt, I highly recommend this shoe if you are looking for a daily trainer that can be worn for any type of run. If you need help finding deals on this shoe or any other shoe, contact me.